Dan Zick is a personal injury attorney who focuses his practice primarily on auto accident cases and Michigan no-fault claims. And while he expertly handles both first and third party claims, his expertise does not end there. Dan is also skilled at litigating numerous other types of personal injury cases as well. He has successfully obtained favorable results for clients suffering from amputation injuries, slip and fall accidents, and dog bite injuries, and practices in state and federal courts throughout Michigan. Dan first joined the firm as a law clerk while attending law school. Here, he began working with the firm’s senior attorneys and partners and gained a comprehensive understanding of Michigan’s complex auto no-fault insurance system. Following law school, Dan gained valuable experiencing litigating serious injury cases in the Metro-Detroit area, where he started his career defending liquor liability cases, among others. This experience helped Dan develop not only a unique perspective on personal injury cases but also an in-depth understanding of Michigan’s liquor liability laws. 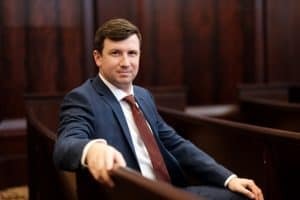 This knowledge has proved vital in his practice as a personal injury attorney, where he often advocates for victims injured in drunk driving accidents. While Dan seeks to handle each case with compassion and thoughtfulness, he is never afraid to get his hands dirty and fight for his clients. “A lawyer needs to not only believe in their client’s case but be willing to take on the challenges that come with pursuing that case.” Dan utilizes this attitude to strongly advocate for survivors of accidents involving motor vehicles, semi-trucks, and motorcycles. He is a vital member of our team and works diligently to protect the rights of the seriously injured in Michigan. Since 2017, Dan has lectured at the People’s Law School, where he teaches a class on Michigan’s Auto No-Fault Law and has also appeared as a guest on Fox 47’s “Morning Blend” program, where he has Dan enjoys these opportunities to teach members of the local community about legal issues which they may encounter in their everyday lives. Outside of work, Dan is a dedicated husband and father. He coaches his kids’ youth soccer and tee-ball teams and enjoys spending time with his wife and children. Dan also enjoys traveling, running, reading, and watching sports. $548,000 Unpaid no-fault benefits claim owed to a foster care facility providing 24/7 care to a severely brain-injured patient. $100,000 Insurance policy limit settlement on behalf of a minor who sustained a mild closed head injury. $90,000 Settlement for a young man who sustained a femur and wrist fracture when he was struck by a vehicle while riding an ATV at Silver Lake Sand Dunes.